A MEMORIAL service for Lou (Velvet Underground) Reed is to be held by a North London chapel, and it has attracted a record crowd. [Yes, “record”. I got it. – Ed.] Seats in the church were booked within 48 hours. In case you’re thinking the reason for a North London church to commemorate a New York musician must be a desire for publicity, you may be wrong. The Newington Green Unitarian Chapel says its congregation “has always walked on the wild side as a centre for dissent”. Walk on the Wild Side was one of Reed’s biggest hits. 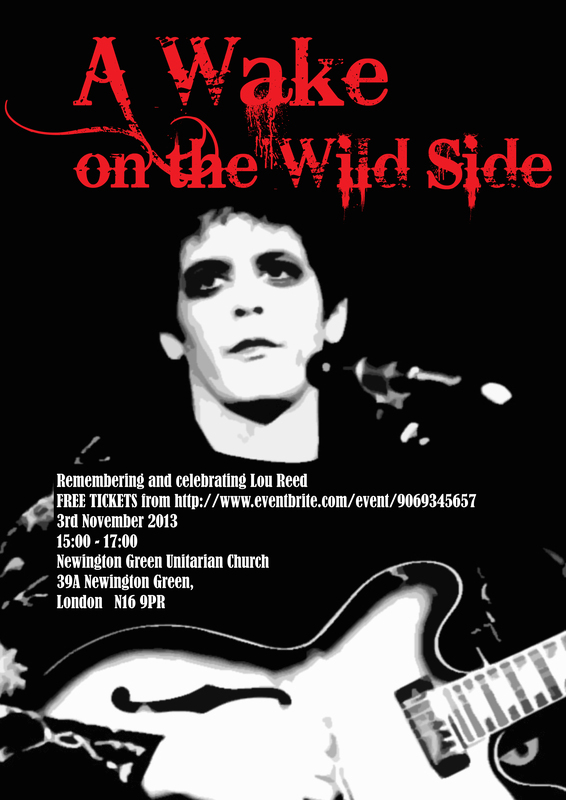 The “celebration of Lou Reed’s life and genius”, entitled Wake On The Wild Side [Like it: worthy of a perfect day. – Ed. ], is to encourage people inspired by his work to pay tribute to the “visionary musician”, who died last Sunday 27 October 2013 at 71. The Arctic Monkeys played a cover of Wild Side at a concert the day after Reed’s death. Pearl Jam has also recorded his work. The wake is being co-organised with writer Stefan Simanowitz, who told Loving Dalston: “Earlier this week I was scanning the internet to see if there were any events in London commemorating Lou Reed. He contacted Pakula and the two started planning the wake. In its 305-year existence, the chapel has voiced support for the French and American revolutions, women’s rights, and gay marriage. Proto-feminist Mary Wollstonecraft studied there in the 18th century; hence the excessive claim made by the sign, see picture above, the Birthplace of Feminism. Lewis Allen Reed was born into a middle-class family on 2 March 1942 and died of liver problems. * Wake on the Wild Side, Newington Green Unitarian Chapel, Hackney N16 9PR, Sunday 3 November 2013, 3pm. Seating is limited and has been fully allocated. It’s so inspiring to see how a community of people can galvanise to organise this most fitting memorial for Lou Reed. I’m playing Lou Reed songs all afternoon and so will be thinking of you.